The Institute of Engineers Plaque and National Landmark Plaque was erected to recognise the cultural and historical importance of Tathra Wharf. 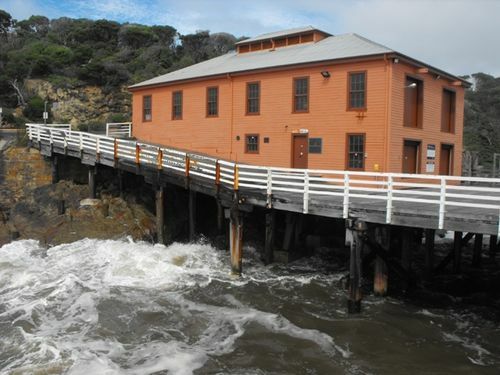 On 19th January 2008 the National President of Engineers Australia, Julie Hammer, and the Mayor of Bega Valley Shire, Tony Allen, unveiled the plaques at the wharf recognizing the site as a National Engineering Landmark. The selected site on the northern side of Tathra Head was the only one suitable for a deepwater wharf along the 80 km stretch of coastline from Merimbula north to Bermagui. The wharf opened in 1862 and was gradually enlarged as trade developed and vessels increased in size. Between 1862 and 1913 it became a large rectangle 45 m long, with a face 37 m wide. An interesting feature of the wharf were the cattle yards and a race for handling of livestock. This feature has been preserved in the restoration of the wharf. The last ship to take freight from Tathra was in November 1954. Tathra is the only open sea timber wharf on Australia’s East Coast surviving from the coastal steamer trade era. Critical to development of the far South Coast of NSW, the wharf dates from 1862. With its facilities it was progressively upgraded, remaining in service until 1954. The wharf exhibits techniques in the design and maintenance of heavy timber marine structures of the NSW Public Works Department over the period. It is associated with eminent engineers E O Moriarty and E M de Burgh, and the builder Oakes & Oakes.